دالوند, مسیب, ملکی, صادق, غلامیان, هادی, طارمیان, اصغر. (1390). بررسی تعیین سینتیک خشک شدن و ضرائب انتقال جرم گونه چوبی ممرز(Carpinus betulus) از منطقه نوشهر. مجله صنایع چوب و کاغذ ایران, 2(1), 39-51. مسیب دالوند; صادق ملکی; هادی غلامیان; اصغر طارمیان. "بررسی تعیین سینتیک خشک شدن و ضرائب انتقال جرم گونه چوبی ممرز(Carpinus betulus) از منطقه نوشهر". مجله صنایع چوب و کاغذ ایران, 2, 1, 1390, 39-51. دالوند, مسیب, ملکی, صادق, غلامیان, هادی, طارمیان, اصغر. (1390). 'بررسی تعیین سینتیک خشک شدن و ضرائب انتقال جرم گونه چوبی ممرز(Carpinus betulus) از منطقه نوشهر', مجله صنایع چوب و کاغذ ایران, 2(1), pp. 39-51. دالوند, مسیب, ملکی, صادق, غلامیان, هادی, طارمیان, اصغر. بررسی تعیین سینتیک خشک شدن و ضرائب انتقال جرم گونه چوبی ممرز(Carpinus betulus) از منطقه نوشهر. مجله صنایع چوب و کاغذ ایران, 1390; 2(1): 39-51. در این بررسی سینتیک خشک شدن و ضرائب انتقال جرم (ضریب نفوذپذیری و ضریب انتشار)چوبگونه ممرز(Carpinusbetulus) از منطقه نوشهر مورد ارزیابی قرار گرفت. برای این منظور، از گرده‌بینه تازه بریده شده تخته‌هایی با دو ضخامت اسمی 5/2و 5 سانتی‌متر تهیه شد و سپس در یک خشک‌کن آزمایشگاهی در دمای ° c40 و رطوبت نسبی 50 درصد تا رطوبت نهایی 6 درصد خشک شدند. الگوی خروج رطوبت، انتشار دما، گرادیان نهائی رطوبت در راستای ضخامت تخته‌ها و ضریب نفوذپذیری و انتشار عرضی تخته‌ها اندازه‌گیری شد. نتایج نشان داد که با افزایش ضخامت تخته‌ها، نرخ خروج رطوبت به ویژه در دامنه جذب و دفع (هیگروسکپیک) کاهش یافته و شیب گرادیان رطوبت بیشتر شده ولی فرایند انتشار دما تحت تاثیر قرار نگرفت. ضریب نفوذپذیری و ضریب انتشار عرضی چوب ممرز به ترتیب برابر با 2m 19-10×91/2 و 1-s 2 m9-10× 29/3 اندازه‌گیری شد. بنابراین با توجه به ضریب نفوذپذیری عرضی کم چوب ممرز، این گونه در کلاسۀ گونه‌های چوبی سخت اشباع در صنعت حفاظت چوب قرار می‌گیرد. در مقابل به دلیل ضریب انتشار عرضی کم آن، چوب ممرز برای کاربردهایی که نیاز به مقاومت بالا در مقابل انتشار بخار آب است، پیشنهاد می‌شود. 1- Mehdavi, S. and habibi, M.R., 2004. ASTM-D 1761–88. 1995. Standard Test Methods for Mechanical Fasteners in Wood. (In Persian). 2- Parsapajouh, D., 1990. Wood technology. Tehran university publication 404. (In Persian). 3- Hossein zadeh, A., toghraie, N., golbabai, F. and Nourbakhsh, A., 2000. Mechanical and physical properties of Hornbeam in mazandaran, Iranian Journal of Wood and Paper Science Research 9: 107-149. (In Persian). 4- golbabai, F., hossein zadeh, A., Nourbakhsh, A., hosseinkhani, H. and Fakhrian, F., 2001. Changes in engineering properties of wood Hornbeam in three regions, Iranian Journal of Wood and Paper Science Research 15: 33-60. (In Persian). 5- Hosseini, Z., 1991. Juvenal wood effect on the mechanical strength of wood pulp from poplar and Carpinus betulus and Alnus quarters, Journal of Natural Resources 45: 40-60. (In Persian). 6- Palandzhyan, VA. and Pinadzhyan, TV. 1974. Inrerrelation between some anatomical and physical and mechanical properties of Hornbean wood. Sb. Tr. Arm. Nll stroit. Materialow I sooruzh 23: 122-131. 7- Perelygin, LM. and Orlova, EK., 1953. Driving and withdrawal resitance of nails . Trud. Inst. Les 9: 8-371. 8- Bielczyk, S., 1953. Investigations of physical and mechanical properties of wood Quercus robur and carpinus betulus originating from a forest community resembling a natural community 3 (3): 92-110. 9- Chen, Y., Choong, E.T. and Wetzel, D.M., 1996. A numerical analysis technique to evaluate the moisture-dependent diffusion coefficient on moisture movement during drying. Wood and fiber science 28: 338-345. 10- Tarmian, A. and Perre, P., 2009. Air permeability in longitudinal and radial directions of compression wood of Picea abies L. and tension wood of Fagus sylvatica L. Holzforschung 63: 352-356. 11- Absetz, I., 1993. Sorption isotherm and moisture diffusivity comparison of spruce and pine, Seminarium I Tra¨mekanik. 12- Pang, S., 1997. Relationship between a diffusion model and a transport model for softwood drying. Wood and Fiber Science 29 (1): 58-67. 13- Tarmian, A., 2008 Reaction wood drying kinetics: compression wood in Picea abies and tension wood in Fagus sylvatica. 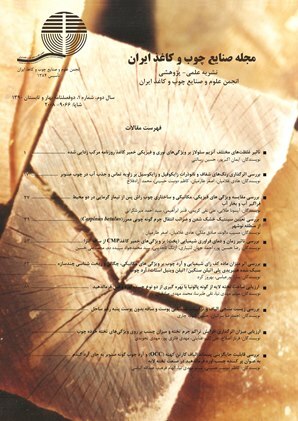 Ph.D. thesis, University of Tehran, 121 p. (In Persian). 14-Taghiyari, H., 2008. Evaluation of Juvenile Wood and Mature Wood Properties of Populus deltoides (69/55) and Populus euroamericana (cv. I-214) for Pulping Industry, Ph.D. Thesis, Faculty of Natural Resources, University of Tehran. (In Persian). 15- Siau, J.F., 1984. Transport processes in wood. Springer, Berlin, Heidelberg, Newyork 245. 16- Malmquist, L., 1991. Lumber drying as a diffusion process. Holz als Roh-und Werkstoff 49: 161-167. 17- Baettige, R., Remond, P. and Perre, P., 2006. Measuring moisture content profiles in a board during drying : a polychromatic X-Rey system interfaced with a vacuum/Pressure laboratory kiln Wood Sciene and Technologe 4: 261–274. 18- Perre, P., 2005. The role of wood anatomy in the deying of wood. great oaks from little acorns grow. 8th International IUFRO Wood Draying Conference . 19- Choong, E.T. and Kimbler, O.K., 1971. A technique of measuring water flow in wood of low permeability, Wood science 4: 32-36. 20- Rousset, R., Perre´, P. and Girard, P., 2004. Modification of mass transfer properties in poplar wood (P. robusta) by a thermal treatment at high temperature. Holz Roh Werkst 62: 113–119.